Store them in a plastic bag or container in the crisper drawer of your refrigerator for up to a few weeks. Watermelon radishes are crisp and firm with a mild taste that is a nice combination of peppery and sweet. 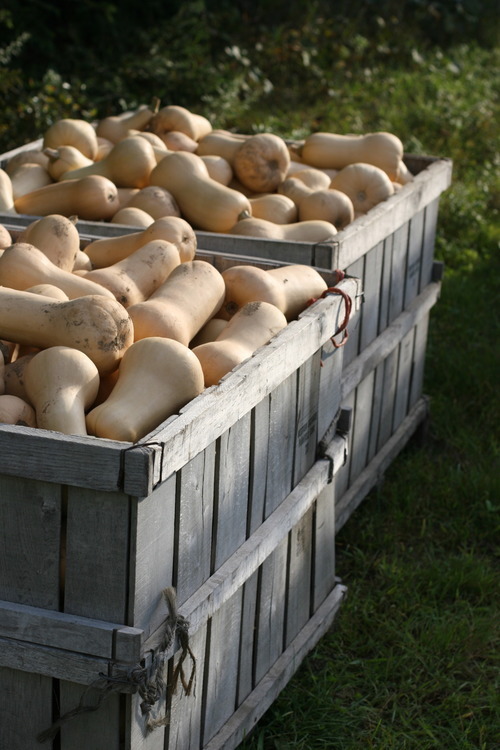 They can be eaten raw, roasted, or mashed like a rutabaga. Also, they do not need to be peeled, just washed well. Peppery, crispy mustard greens, also known as leaf mustard, is indeed one of the most nutritious green-leafy vegetables available around. Its lovely top greens have actually more vitamin A, carotenes, vitamin K, and flavonoid anti-oxidants than some of commonly consumed fruits and vegetables. This crispy leafy green is obtained from mustard plant belonging to the Brassica family, which also includes cabbage, broccoli, brussels sprouts, etc. Scientific name: Brassica juncea. Mustard Greens can be stored in a bag in the fridge for up to a week. Add mustard greens to your salad for a lively, peppery accent. You can saute them, but they can also be boiled or braised. Short cooking is the best way to preserve the flavor and texture of mustard greens. Overcooking will cause greens to become soft and mushy. Dandelions are nature's richest green vegetable source of beta-carotene, from which Vitamin A is created, and the third richest source of Vitamin A of all foods, after cod-liver oil and beef liver! They also are particularly rich in fiber, potassium, iron, calcium, magnesium, phosphorus and the B vitamins, thiamine and riboflavin, and are a good source of protein. Dandelion greens can be stored in a bag in the fridge for up to a week. Cooking dandelion greens makes them less bitter. They are good sauted or tossed with pasta or potatoes or added to quiches. They make a great addition to soups and stews. To soften dandelion green's bitterness, pair them with sweet flavors, like balsamic vinegar or honey; spicy flavors, like garlic, chile, pepper, or onion. Tomatoes have fleshy internal segments filled with slippery seeds surrounded by a watery matrix. They can be red, yellow, orange, green, purple, or brown in color. Although tomatoes are fruits in a botanical sense, they don't have the dessert quality sweetness of other fruits. Instead they have a subtle sweetness that is complemented by a slightly bitter and acidic taste. Cooking tempers the acid and bitter qualities in tomatoes and brings out their warm, rich, sweetness. We grow a wide variety of beefsteak, heirloom, and cherry tomato varieties. Tomatoes should never be refrigerated until they (1) have been cooked, (2) have been cut or put into a raw dish like a salsa, or (3) are fully ripe and would spoil if left further at room temperature. Place tomatoes stem end up, and don't put them on a sunny windowsill to hasten ripening. Instead, put tomatoes in a sealed paper bag with or without ethylene-producing fruit such as bananas. Ripe tomatoes will hold at room temperature for two or three days. Ripe tomatoes you've refrigerated to keep from spoiling will taste better if you bring them to room temperature before eating. A good serrated knife is far superior to a flat edged knife for slicing tomatoes. Avoid cooking tomatoes in aluminum pots, as the tomato will develop an unpleasant metal taste. Summer Squash/Zucchini are harvested when immature (while the rind is still tender and edible). Store in a plastic bag in the refrigerator for up to one week. The bag should be perforated or loosely tied not sealed tightly. There is no need to peel or seed your zucchini. Zucchini can be eaten raw in salads. If you are cooking zucchini, slice it and salt it to draw out some of the water, then cook quickly over dry, high heat to caramelize the flesh before it has a chance to steam and get soggy. Dry heat cooking generally suits zucchini best. The rutabaga, swede (from Swedish turnip), or yellow turnip (Brassica napobrassica) is a root vegetable that originated as a cross between the cabbage and the turnip. Store in a plastic bag in the refrigerator for up to three weeks. Prepare by using a pairing knife or vegetable peeler to remove the outer layer. Cut off very bottom so that you will have a flat surface for chopping. Use large chef's knife to halve then quarter your rutabaga. Boiling or mashing makes a great side dish! The potato belongs to the Solanaceae or nightshade family whose other members include tomatoes, eggplants, peppers, and tomatillos. They are the swollen portion of the underground stem which is called a tuber and is designed to provide food for the green leafy portion of the plant. We grow many different varieties of potatoes, including Keuka Gold, Red, Purple, Yukon Gold, Fingerling, and more! Potatoes like cool (45°F to 50°F) humid (but not wet) surroundings, but refrigeration can turn the starch in the potatoes to sugar and may tend to darken them when cooked. Store in burlap, brown paper, or perforated plastic bags away from light, in the coolest, non-refrigerated, and well-ventilated part of the house. Under ideal conditions they can last up to three months this way, but more realistically, figure three to five weeks. New potatoes should be used within one week of purchase. Don't store onions and potatoes together, as the gases they each give off, will cause the other to decay. When baking, you can stand potatoes on end in muffin tins if you're baking several. Bake extra and use for hash browns the next day! Keep in mind, to preserve the abundance of nutrients in your potatoes, cook them in their skins. Steam instead of boiling, as water naturally leaches some of the nutrients from food cooked in it. Sweet peppers are plump, bell-shaped vegetables featuring either three or four lobes. They usually range in size from 2 to 5 inches in diameter, and 2 to 6 inches in length. Inside the thick flesh is an inner cavity with edible bitter seeds and a white spongy core. Bell peppers are not 'hot'. They contain a recessive gene that eliminates capsaicin, the compound responsible for the 'hotness' found in other peppers. We grow green bell peppers, that if left on the plant, will turn yellow and then red. Peppers like cool not cold temperatures, ideally about 45°F to 50°F with good humidity. Peppers are ethylene sensitive, so they should not be stored near ethylene-producing food such as pears or apples. Put peppers in plastic bags and they will keep up to five days in the refrigerator. Green peppers will keep slightly longer than the other, more ripe, varieties. Green peppers tend to have a green-as in unripe-flavor that many people don't care for, but the yellow, red, and orange peppers can be very sweet. When slicing large peppers, cut them open first and then slice them with the inside of the pepper facing your knife. The inside of the pepper is not slick and grabs willingly and less dangerously. The parsnip (Pastinaca sativa) is a root vegetable related to the carrot. Parsnips resemble carrots, but are paler than most of them and have a stronger flavor. Like carrots, parsnips are native to Eurasia and have been eaten there since ancient times. Trim off any green tops and refrigerate the roots for up to three weeks., storing in a perforated plastic bag to retain moisture. Most of the flavor in parsnips is right below the skin so rather than peel too much of the outer layer , you can just give them a good scrubbing. You can roast, bake, broil, mash them or even puree them into a soup. Small, tender parsnips may be peeled and grated raw into salads. The word onion comes from the Latin word unio for "single," or "one," because the onion plant produces a single bulb, unlike its cousin, the garlic, that produces many small bulbs. The name also describes the union (also from unio) of the many separate, concentrically arranged layers of the onion. We grow several different varieties of onions, including Walla Walla, yellow, and red. Store in a cool, dry, well ventilated place, in single layers. If the onions at home show signs of sprouting, cut away the sprouts and use them immediately. Use fresh onions (like Walla Walla) within a week. Chopped or sliced ions can be stored in a sealed container for 7-10 days in your refrigerator. Don't want to cry? Refrigerate onions 30 minutes before preparation to prevent tearing, or light a candle by your cutting board. To remove the smell of onions rub hands and equipment with lemon juice or salt. When cooking, high heat makes onions turn bitter, so always use low or medium heat. 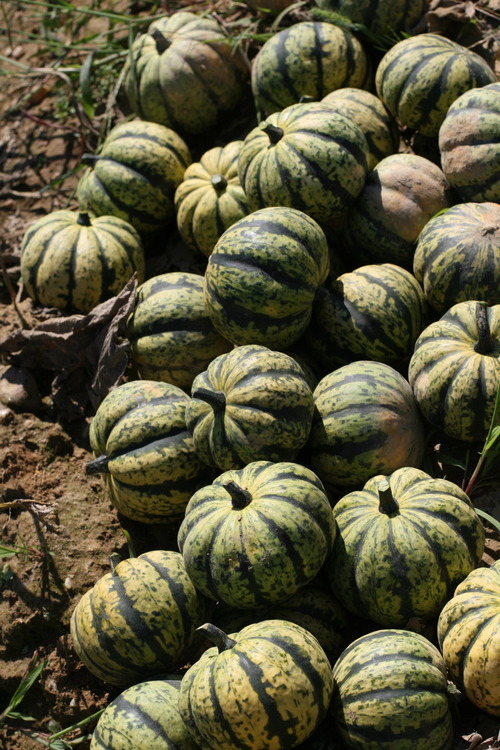 We grow several varieties of melons, including musk melons, cantaloupe melons, and watermelons. Can be kept on the counter until ripe, then immediately refrigerated until ready to eat! Our melons are usually ripe right off the vine, so you can put them straight in the fridge when you get them home. Keep in mind how wonderful melons are in a salad! Mix your cool sweet melon with some delicious fresh greens and cheese--Yum!